Whether you enjoy training and want to take it to a new level, or are just looking for something fun to do with your dog, there’s a canine sport for you. Canine sports are a great way to increase your dog’s responsiveness, deepen your enjoyment of each other, and just have a great time. Canine sports are for all dogs, of any age or breed. Whether you’ve got a pure-bred Border Collie or a pure-bred mutt, whether there’s a Great Dane or a tea-cup-sized pooch at the other end of your leash, come play with us. I take a unique approach to competition obedience class, mixing students of all levels in a single class. This class is designed to get you and your dog introduced to the sport. 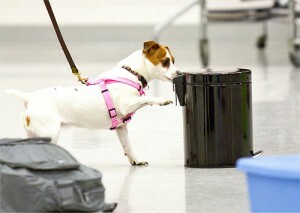 Your dog will learn the basics of odor recognition and interior searches. Building from the intro class, we introduce your dog to additional odors and you to more searching skills. The good times continue! This ongoing class is tailored to the level of each dog-human team, to maximize your enjoyment and progress. For the incredible fun of it! Time for class! Where do I go? Classes take place at 403 Washington Boulevard in Mundelein.